You are at:Home»News»What is LNG Power? The world is on the brink of an eco-friendly revolution, with environmentalists predicting (or perhaps hoping is a better word!) that in the next few decades we’ll have made the switch to 100% sustainable energy solutions. The cruise ship industry is not exempt, and already lines such as Carnival are pioneering ‘green’ cruising concepts that are set to shape the face of the future. The line has recently placed an order for a quartet of LNG powered ships that will slash operational costs, minimise environmental impact and offer passengers the chance to keep their carbon footprints as small as possible. The concept has created quite the buzz, but what exactly is LNG power and what makes it so eco-friendly? Read on for an overview of the technology and why we love it! In case you hadn’t already figured it out, LNG is short for Liquid Natural Gas. The gas is predominantly methane (CH4) based and is clear, colourless, non-corrosive and non-toxic. The liquid forms when natural gas is cooled to -162ºC, a process that shrinks the volume of the gas by 600 fold. This makes it markedly easier to store and transport. Given the fact that LNG is 600 times smaller than conventional natural gas cruise ships are able to store large amounts on-board. At sea this will be used to generate 100% of power. From heating showers and lighting up cabins to powering stage show spotlights and keeping buffets warm, LNG will lie at the heart of the entire cruise experience. While Carnival Corporation’s latest ships will store LNG on-board the gas can also be delivered to cruise ships using barges. Becker Marine Systems pioneered the concept when it sent a 76.7m long, 11.4m wide LNG hybrid barge to 7.5 megawatts of low-emission power to an AIDA vessel during a Hamburg layover this May. The barge essentially acted as a floating power plant that generated power using a container filled with 15 tons of LNG. After being heated the gas was then transferred to the cruise ship using five Caterpillar motors. In the future this process could also emerge as a popular option for cruise ships wanting to join the LNG revolution. LNG is a non-toxic gas which makes it amazingly eco-friendly. In fact, it’s renowned as the cleanest burning fossil fuel on the planet and releases far less carbon dioxide emissions than its coal and oil based counterparts. Both at-sea and in port it will prevent ships from releasing harmful soot particles and sulphur oxides that pollute the air and ocean. When LNG is eventually exposed to the environment it rapidly evaporates which means no toxic residue settles on water or soil. This also eliminates the risk of a spill as any stray LNG would simply vaporise immediately. For the cruise industry this represents a terrific opportunity to cut down on greenhouse gas emissions and contribute to creating a cleaner, greener world. Image sourced via Flickr Creative Commons and Celebrity Cruises Media Center. 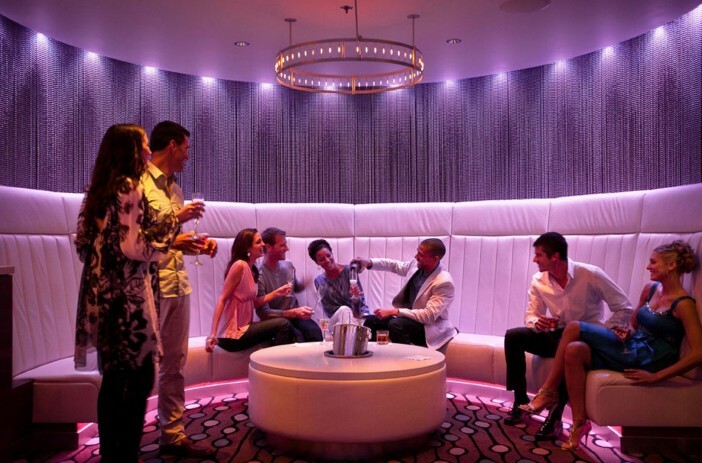 Credit: Pen Weggener and Celebrity Cruises.